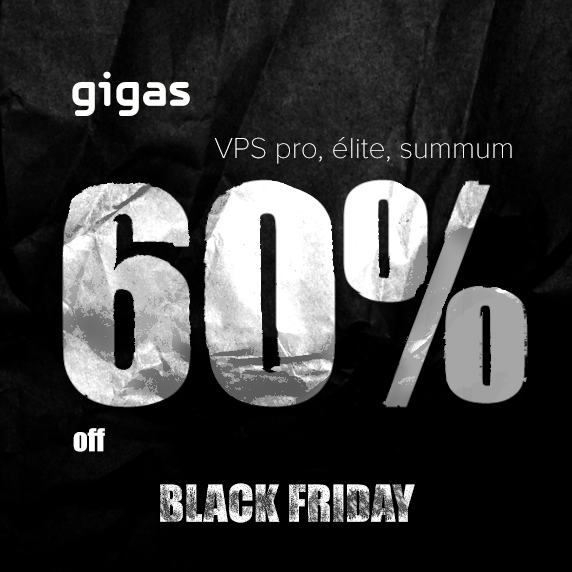 Gigas Black Friday Deals 2014 | Blog - Gigas The Cloud Computing Co.
On Black Friday, we go further and offer you the opportunity to get a 60% discount on Cloud VPS pro, elite and summum for… 3 days! Friday November 28 at 00:00 until Sunday 30 at 23:59 (GMT + 1). * Discount applies only to the first year. What to do to benefit from the discount. Go to the Cloud VPS gigas section. Select the Cloud VPS you are interested in. If you have any questions, our support department will be happy to help you 24 hours a day. Do not miss this opportunity.The countdown has begun!